UNITED NATIONS, July 15 -- With small countries in Africa dominating the Security Council's July 15 schedule, there were few reporters, fewer updates and, some concluded, no news. But it depends on how you definite it. 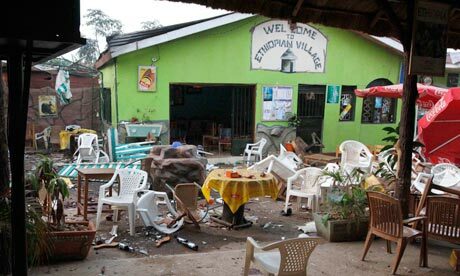 Liberia is on the cusp of becoming the fifth country on the agenda of the UN Peacebuilding Commission. If no member objects to a letter pending in the Council, the referral will be made. Meanwhile one of the four countries already on the PBC agenda, Burundi, recently had a one party election marred by tossed grenades and now the threat of attack by Al Shabab. Burundi has soldiers in Somalia. 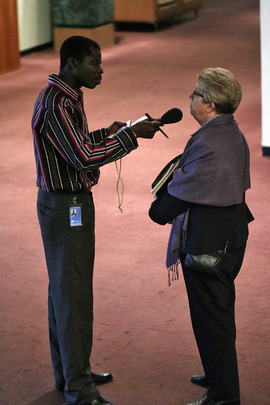 Inner City Press spoke this week with the UN's envoy to Burundi Charles Petrie. He put a positive spin on the one party election, saying it was not as violent as it might have been. Petrie said the opposition is weak, and the UN must play the counter-balance that civil society and opposition parties would in other countries. He should know: he was thrown out of Myanmar by the government, then served for a time in a humanitarian role on, but not in, Somalia. He was in the French military but not, as one rumor has it, in the Foreign Legion. The Council should have heard from him but didn't. The same might be said of the UN's new envoy to Somalia, Augustine Mahiga. He went into the Council's quiet room on July 14, but was not heard from by the Council as a whole. He met with the Permanent Five, one by one. He stopped to speak to Inner City Press, about including Al Shabab on the Al Qaeda sanctions list under Council Resolution 1267 in the wake of the Kampala bombings. Later on July 14, at an ill-attended UK reception on climate change in the General Assembly lobby, Inner City Press asked UK Permanent Representative Mark Lyall Grant about 1267 and the Shabab. He pointed out that they are already on the Somalia sanctions list, and who knew who is or is not truly affiliated with Al Qaeda. An Ethiopian diplomat added, not surprisingly, they are “definitely” with Al Qaeda. But the Council sticks to its schedule. Guinea Bissau was the topic for July 15. The coup leader now heads the military; the UN “took note” of it. A Presidential Statement is to be drafted in the coming days. Still and all, the Permanent Representatives of France, Japan and Mexico strode into the Council just after 10 a.m.. The active Number Three of the US, Brooke Anderson, was made to show her identification card to get in. The day previous, Permanent Representative Susan Rice was in the Council but left early, to go get an award from the WNBA and, the press release said, Bacardi Gold. Inner City Press has wanted to go and see, but it conflicted with UN press conferences. 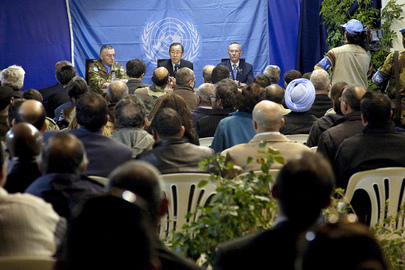 The Security Council has met every day this week. Gabon's Perm Rep meandered in at 10:25. There was only one reporter at the Security Council stake out: this one. Something, it was rumored, would happen. Update of 3:20 p.m. -- Nigeria's Ambassador, the Council's president for July, read out a four paragraph statement. As Inner City Press predicted this morning, it did not assign blame. But in the interim, the spokesman for Al Shabab has taken credit for the bombings, saying they were months in the planning. Inner City Press asked Nigeria's Ambassador on camera why blame was not ascribed, and if this might not discourage countries from sending peacekeepers to Somalia. She declined the first, and to the second question said “there is a peace to keep in Somalia.” Video here.